A leading variety in Europe, particularly in the colder areas. We all remember the first of those very severe winters a few years ago, when many varieties suffered damage to the younger growth. Hino, Red proved particularly hardy with no damage at all in our trials, the crop the following summer was magnificent. 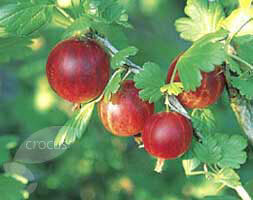 The fruits are medium sized, dark red and have good Mildew resistance. Flavour is excellent. An easy to grow variety with strong growth.